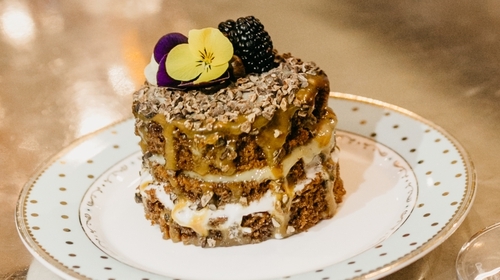 Celebrate Mother's Day with a cake-filled afternoon tea. The Address at Dublin 1 is a hotel where your stay will be the perfect blend of refined comfort and exclusive service. With its own exclusive rooftop Club Lounge offering amazing views of the city and award-winning dining in McGettigan’s Cookhouse & Bar, it’s a top class location that’s exclusive and self-contained. A twist on the civilised Afternoon Tea trend, Caketails allows you to have your cake and drink* it too! The perfect treat for Mother’s Day or just a girly catch-up, you can enjoy the delicious combination of Red Velvet Cake and a Cosmopolitan, or Coffee Cake and an Espresso Martini for just €10 per person. Simply Follow RTÉ Lifestyle's Twitter and tweet us your favourite type of cake with the hashtag #RTECake. Follow RTÉ LifeStyle on Facebook and tell us your favourite type of cake on the competition post! General RTÉ Competition rules apply, a copy of which is viewable here. The prize includes: Caketails package for 2, Club Room for two with bathrobe & slippers, Club Lounge Access, Free Wi-Fi, Full-Irish Breakfast.